How many moku, or districts, does Oʻahu have? Why are there so many place names on Oʻahu that start with “wai” (water)? If you were to visit the different kaulana (famous) place on Oʻahu, what would be the best way to get around? Can you go anywhere you like? Are there people you know who could give you guidance? 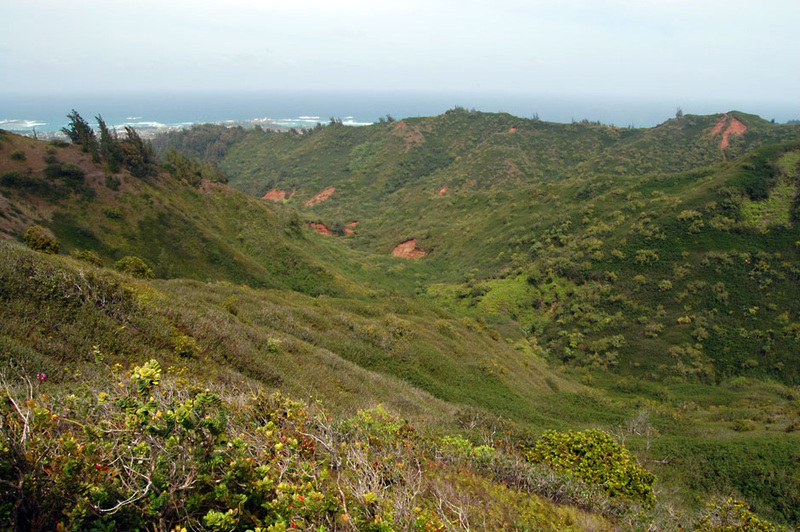 What areas of Oʻahu are the driest, and which are the wettest? Has it always been this way? Why would a place with an abundant water supply become dry over time? Why do you think Oʻahu has become the most populated island of Ka Pae ʻĀina? Is the growth of cities and commerce is a good thing? Why or why not? Find a map of Oʻahu and look at the names of different places. Are the names in Hawaiian or English? See if you can figure out the older names of places like Diamond Head, Pearl Harbor, and Chinaman’s Hat. ʻAʻole hoʻohalahala iā Oʻahu a puni, he momona ma uka, he momona ma kai, he lani i luna, he honua i lalo. Around all of Oʻahu, there is nothing about which to complain, there is fertility upland, fertility in the lowlands, the sky is above, the earth below. If you live within the archipelago of Hawaiʻi, chances are, you live on Oʻahu. Most of Hawaiʻi’s residents do. And if not, you’ve probably visited a few times. What makes Oʻahu so special that nearly one million of us live here? Read on and perhaps you will agree that Oʻahu is “ka ʻōnohi o nā kai”—the center of the Hawaiian seas. Born of godly descent, Oʻahu is the child of Papa (earth goddess) and Lua. Because of this parentage, Oʻahu is also called Oʻahualua (Oʻahu, child of Lua). Before Oʻahu are born the main islands to the east, and after Oʻahu are born the islands to the west. This is just one version of Oʻahu’s birth. In another origin story, Oʻahu is the child of Papa and Wākea. In both genealogies, Oʻahu’s sacred status is clear. But what makes Oʻahu unique? Edible mud, a moʻo guardian, and a magical fish-attracting branch—these definitely have the makings of uniqueness. And all of these call Kawainui Marsh home. 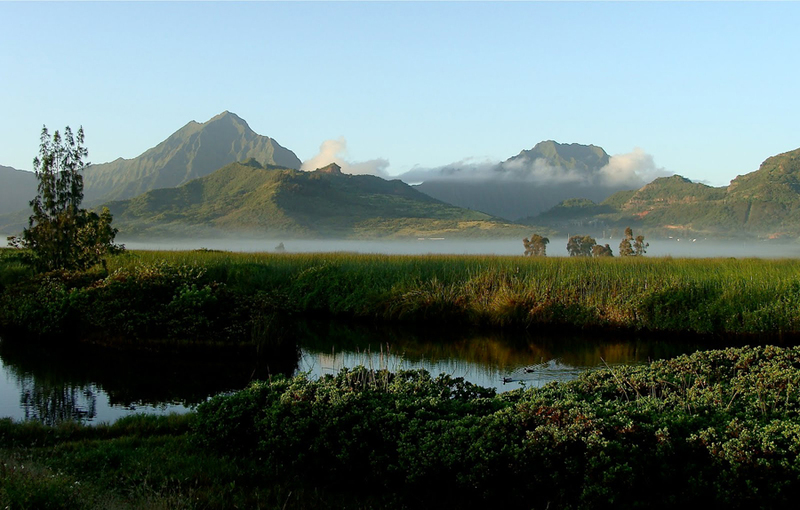 Located in the windward ahupuaʻa of Kailua, in the district of Koʻolaupoko the marsh was once the largest freshwater fishpond on the island. Together with other fresh water sources, Kawainui helped provide Oʻahu with a significant amount of inland fresh water. Where there is wai (water) there is waiwai (wealth). When Kamehameha and his warriors stayed at Kailua, the great feast that had been prepared for them was already eaten by Oʻahu warriors. All that was left was fish oil on ti leaves! And when Kailua was completely out of poi for them, the people of Kailua secretly gathered the edible mud of Kawainui and put it in calabashes. The mud was eaten by the warriors and chiefs of Kamehameha. In 1872, Kamehameha’s great-granddaughter, Princess Pauahi, and Princess Likelike went to Kailua to taste this mud. It was described as reddish-pink with spots and jello-like, very much like haupia. Sound like something you might try? Kona, mai ka puʻu o Kapūkakī a ka puʻu o Kawaihoa. The district of Kona extends from the hill of Kapūkakī (Red Hill) to the hill of Kawaihoa (Koko Head). Kona has been and continues to be a happening district. Within its borders are the likes of Waikīkī, a favorite playground of the aliʻi. 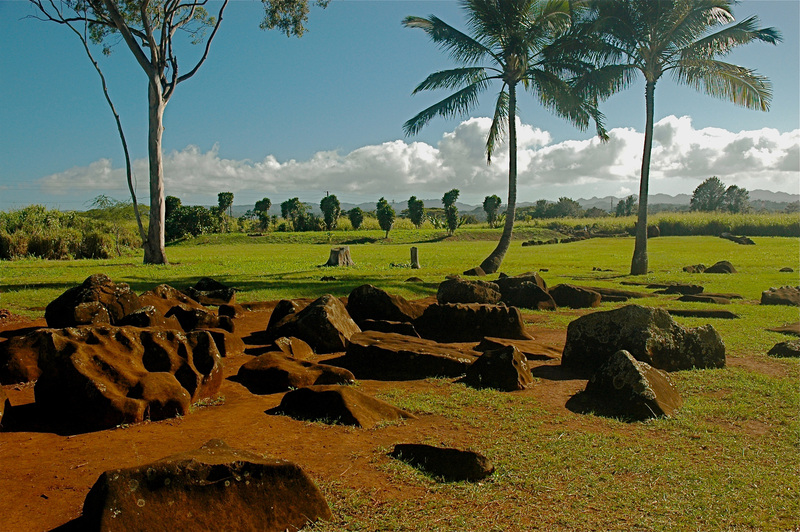 Some high rulers made their home and the ruling center of the kingdom here, including Kamehameha and Māʻilikūkahi. Besides its ocean sports, Waikīkī had loʻi kalo and loko iʻa and was a thriving center of food production. The wind of Waikīkī that blows through the coconut fronds is called Wehelauniu. Honolulu, which was formerly a fishing village called Kou, has the Kūkalahale rain that passes quickly but still sends people running under the eaves of their house. The name Kona is not unique to Oʻahu. We most often hear it used for the leeward district on Hawaiʻi Island. But it is also the name of districts on Molokaʻi, Kauaʻi, and Niʻihau. The name comes from our Polynesian kūpuna. “Kona” is the same as “Tonga” in some other Polynesian languages, and it can refer to the southerly or the leeward side of an island. On the opposite side is Koʻolau or Tokelau, the windward side. As we run through Kona and enter the next moku, or district, we find ourselves in ʻEwa. Most tourists in ʻEwa will visit Pearl Harbor. Do you know how Pearl Harbor got its English name? It used to have oysters, some of which had pearls in them! Our kūpuna called the oysters “iʻa hāmau leo”—fish that are gathered in silence. These iʻa were famous at Puʻuloa, the traditional name for the Pearl Harbor area. Puʻuloa’s most famous inhabitant also lived in the ocean. Kaʻahupāhau was the shark guardian of Puʻuloa. She protected humans from man-eating sharks and other dangers. That’s why she is still sung about in songs today. The shores of Puʻuloa were incorporated into fishponds, producing an abundance of protein. Fish, porpoises, and even sharks were caught by hand, for which Oʻahu was famous. 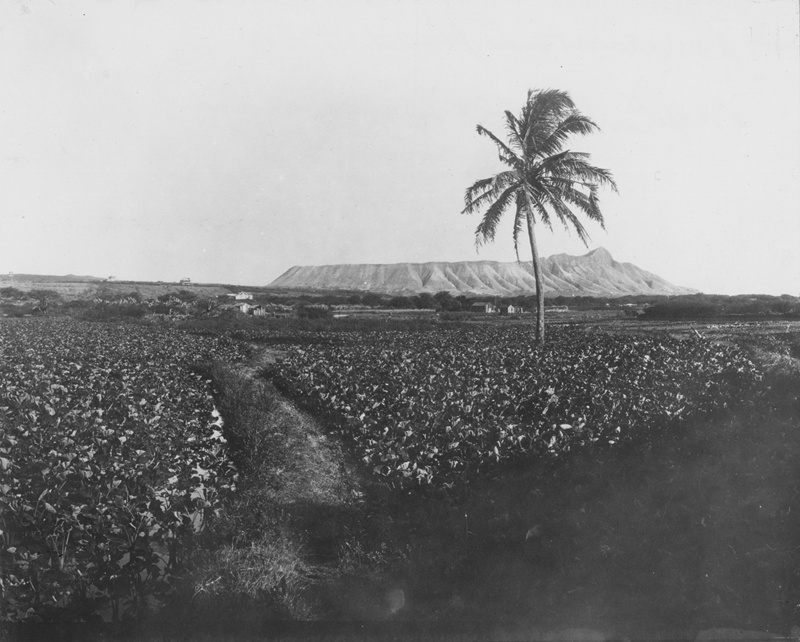 The first ʻulu tree was said to have been planted here at Puʻuloa. Unfortunately, the story of Puʻuloa, like so many other places across the pae ʻāina, is one of loss and destruction. Cattle introduced to Hawaiʻi ate much of the plants upland, causing the earth to be washed into the sea. 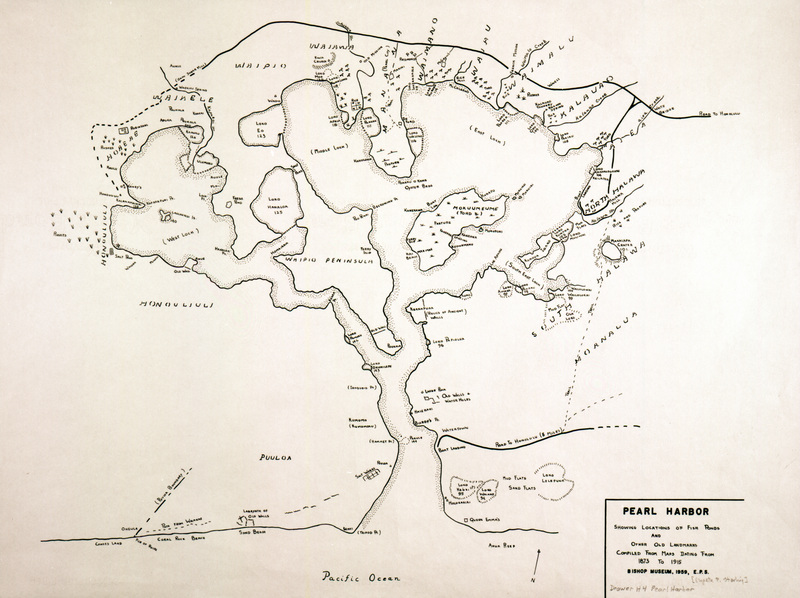 Being the only large natural harbor in the North Pacific, Puʻuloa attracted America’s Navy. Here, they could base their ships in case of war with an Asian country. And so, the home of Kaʻahupāhau, the iʻa hāmau leo, and numerous fishponds experienced further destruction, this time to fit American battleships. The skeleton of a 14-foot shark was found in dredging Puʻuloa. The iʻa hāmau leo have not been seen for generations. And Puʻuloa is not able to feed our people the way it once had. Puʻuloa, known as Pearl Harbor in English, has long been contested terrain. The perceived military and commercial value of Puʻuloa contributed to the illegal overthrow of the Hawaiian Kingdom. A whole nation of people lost their independence and continued to lose their way of life. And today Hawaiʻi is the most militarized “state” in the United States. 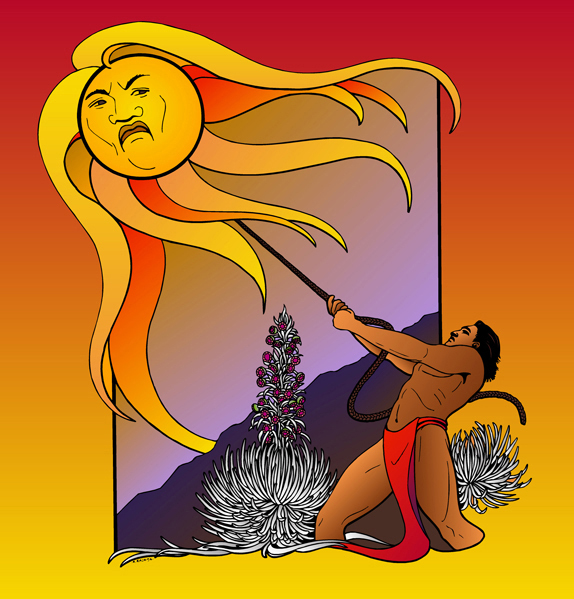 Remember the story of the demigod Māui snaring the sun to slow it down? One version of that story says he did it at Puʻuheleakalā in Waiʻanae, the next moku on our tour. Famed in old mele, the plains of Līhuʻe in Waiʻanae Uka were known as a cold place where kupukupu ferns and fragrant nēnē grass grow. Here the battle of Kalena took place, in which Chief Kūaliʻi and two others took on 12,000, and won. It is said that the Līhuʻe on Kauaʻi was named after this Līhuʻe. All this touring making you ʻono for iʻa? You’re in the right place. Waiʻanae is known for its deep-sea fishing grounds. Prior to Chief Māʻilikūkahi, the ruling center of Oʻahu was on the central plateau near Kūkaniloko, which takes us to the district of Waialua. Kūkaniloko is also called the birthing stones. It is the famous birth place of Oʻahu’s high aliʻi (chiefs). There are large boulders that women used to sit or lay on to give birth. An important king of Oʻahu born at Kūkaniloko is Kākuhihewa. Within his government building, geography, astronomy, divination, poetry, history, warfare, and physical fitness were studied and practiced. He treated the weakest and most vulnerable as his favorites. His reign is remembered as one of peace and prosperity, such that the island is sometimes referred to as Oʻahu o Kākuhihewa (Oʻahu of Kākuhihewa). It is no coincidence that Kākuhihewa is the great-great-great-great-grandchild of Māʻilikūkahi, who also was a very good ruler and also born at Kūkaniloko. He developed the ahupuaʻa system on this island. The following mele shares the moʻolelo of the first aliʻi born at Kūkaniloko—Chief Kapawa of Waialua. Kūkaniloko remains a sacred place for Native Hawaiians. However, it is an especially significant place for the aliʻi. Its location near the center of the island and its sanctity as the birth site of the highest aliʻi make Kūkaniloko a physical and spiritual piko of Oʻahu. 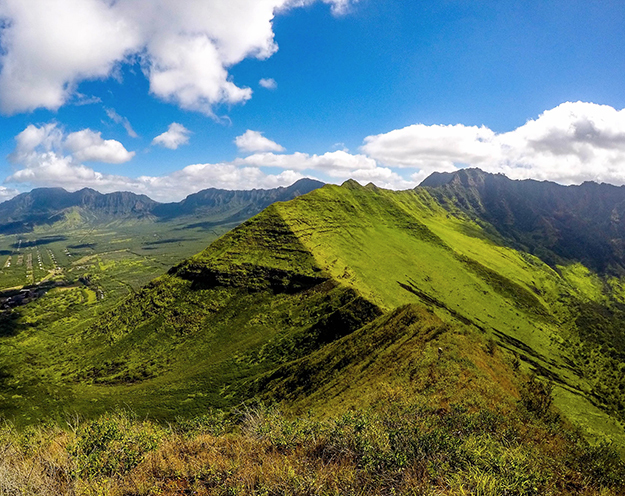 Standing above Waiʻanae and Waialua is Kaʻala, the tallest peak on Oʻahu. There resides the benevolent goddess Kaiona who sends her ʻiwa bird to guide the lost out of the forest. As we are guided on, we find ourselves in the next moku, Koʻolauloa. The world-renowned surf breaks of Oʻahu’s North Shore are mostly found here in Koʻolauloa, including Waimea Bay, Pipeline, and Sunset. The beautiful twin sisters Lāʻieikawai and Lāʻielohelohe were born at Lāʻie. Their mother is Mālaekahana, also the name of the ahupuaʻa abutting the ahupuaʻa of Lāʻie. It is in this moku that the loving but mischievous pig god Kamapuaʻa is born, at Kaliuwaʻa. But he didn’t appear as a pig at first. He was born as a cord! He eventually grew into a pig, and he would help his grandmother and brother plant their huli (kalo shoots). Kamapuaʻa loved to eat chickens and to cause trouble to the aliʻi nui. He could steal all of Chief ʻOlopana’s chickens from the ahupuaʻa of Kapaka, Punaluʻu, and Kahana in one night. The chief sent men from parts of Koʻolauloa to capture Kamapuaʻa. His grandmother, Kamaunuaniho, would chant his mele inoa (name chant), and Kamapuaʻa would free himself and eat all of the men, except for his relative, whom he would always spare. Eventually ʻOlopana sent all the men from the entire island to make war on Kamapuaʻa. Upon hearing this, Kamapuaʻa needed to get his family to safety. The destination: Waialua, on the other side of the Koʻolau Mountains, but that would require scaling the impossibly high cliff of Kaliuwaʻa. So Kamapuaʻa leaned against the cliff and his family climbed over his back. His grandmother refused to step on his back, so he turned and she climbed up his front. And they all, including Kamapuaʻa, escaped . . . for the time being. But not to fret, Kamapuaʻa is eventually victorious and lives to see many more adventures across the pae ʻāina. He lepo ka ʻai a Oʻahu, a māʻona nō i ka lepo. Earth is the food of Oʻahu, and it is satisfied with its earth. Beauty, tradition, and uniqueness are still very much a part of our Oʻahu, but they can be harder to find. Oʻahu has experienced a lot of change and destruction. Yet within its moʻolelo are ongoing efforts of aloha ʻāina (love for the land) and restoration. Being the capital of the state of Hawaiʻi and the urban center, there are continued threats of overdevelopment. It is important that pono (balance) be restored to Oʻahu. To restore pono, we need to take care of the ʻāina. This will return the balance of the relationship between kānaka (people) and ʻāina. When this balance is restored, it will increase the mana (spiritual power) of both kānaka and the ʻāina. One way kānaka are working to restore pono on Oʻahu is by building kīpuka. 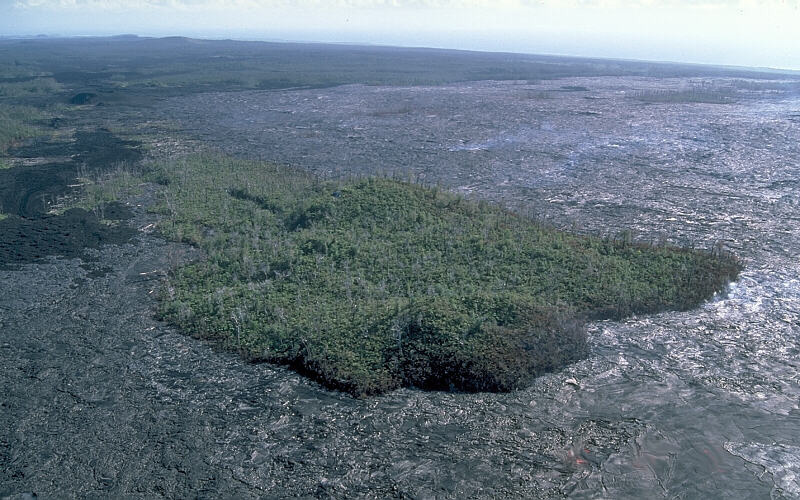 Literally, kīpuka is a small patch of land with greenery in the middle of a lava-destroyed area. This small patch sends seeds out into the surrounding area. And from this small kīpuka a native forest can be replenished again. This restores pono. Figuratively, there are many kīpuka on Oʻahu. 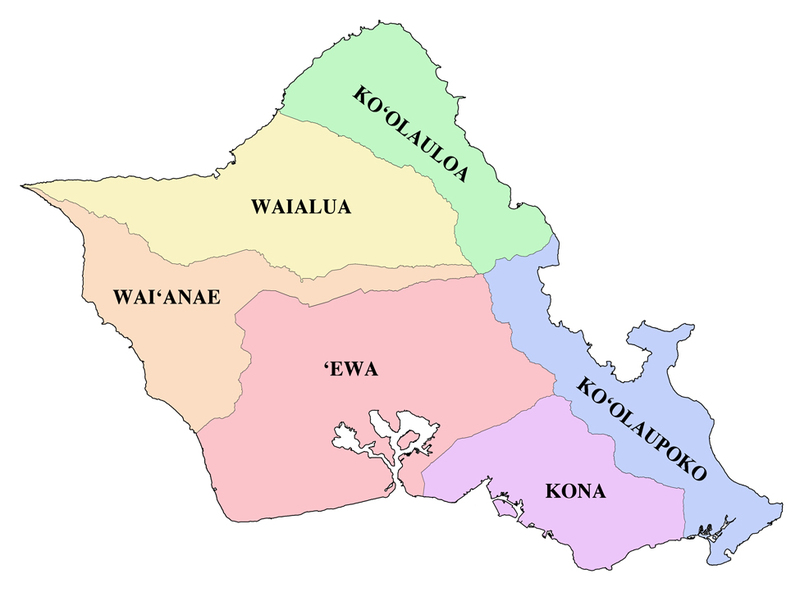 Several kīpuka are Waikalua Loko, Paepae o Heʻeia, Papahana Kuaola, Māhuahua ʻAi o Hoi, and Kōkua Kalihi Valley. Each of these represent a community-based development project built on varied models of aloha ʻāina. These kīpuka will continue to grow and expand aloha ʻāina on Oʻahu. In the picture you can see a natural kīpuka at work. Original Hawaiian place names are always in style. 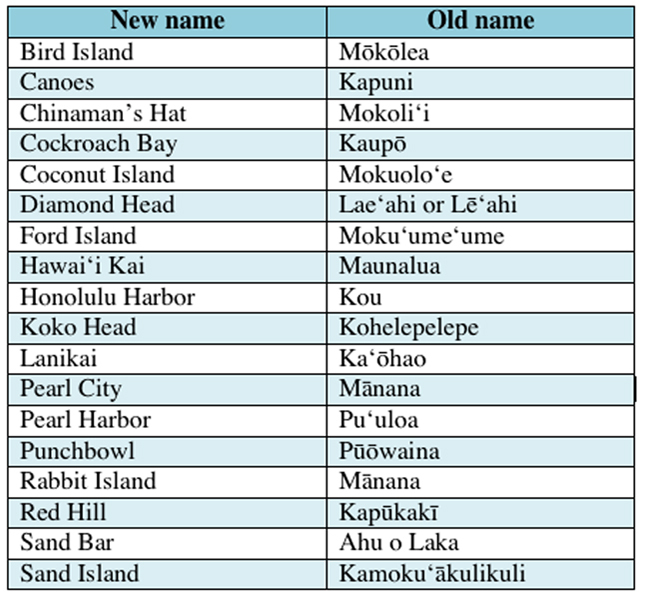 Keep it real with this list of contemporary Oʻahu place names and their older, cooler counterpart. ʻUku liʻi ka pua, onaona i ka mauʻu. Tiny is the flower, yet it scents the grasses around it. No matter how young or old, how big or small, you can make a difference. Starting off small, like using the traditional name of a place, helps to reinforce our special connection with the ʻāina. Volunteering at beach and stream clean-ups, growing your own fruits and vegetables, and testifying for legislation that protects our ʻāina are more ways to show aloha ʻāina. Oʻahu needs us, but not more than we need Oʻahu. Hāhā pōʻele ka pāpaʻi o Kou. The crabs of Kou are groped for in the dark. Hōʻā ke ahi, kōʻala ke ola. ʻO nā hale wale nō kai Honolulu; ʻo ka ʻai a me ka iʻa i Nuʻuanu. Light the fire for there is life-giving substance. Only the houses stand in Honolulu; the vegetable food and meat are in Nuʻuanu. Hui aku nā maka i Kou. The faces will meet in Kou. Ke awa laʻi lulu o Kou. The peaceful harbor of Kou. ʻĀina koi ʻula i ka lepo. Land reddened by the rising dust. Anu ʻo ʻEwa i ka iʻa hāmau leo. E hāmau! ʻEwa is made cold by the fish that silences the voice. Hush! Haunāele ʻEwa i ka Moaʻe. ʻEwa is disturbed by the Moaʻe wind. He kai puhi nehu, puhi lala ke kai o ʻEwa. Ke awa lau o Puʻuloa. The many-harbored sea of Puʻuloa. Ka malu niu o Pōkaʻī. The coco-palm shade of Pōkaʻī. Ola Waiʻanae i ka makani Kaiāulu. Waiʻanae is made comfortable by the Kaiāulu breeze. Waialua, ʻāina kū pālua i ka laʻi. Waialua, land that stands doubly becalmed. I Waialua ka poʻina a ke kai, ʻo ka leo kā ʻEwa e hoʻolono nei. The dashing of the waves is at Waialua but the sound is being heard at ʻEwa.